So much fun for toddlers to decorate and redecorate. 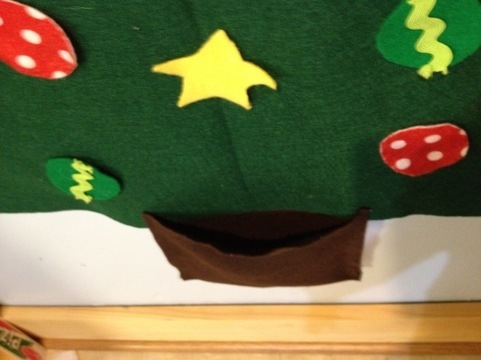 First start by folding your green felt in half then mark and cut your triangle for the tree. Next cut a long rectangle out of brown felt for the tree trunk. Finally cut a three or four inch strip of ribbon. Now get out your hot glue gun. Glue your trunk to the back of your tree. 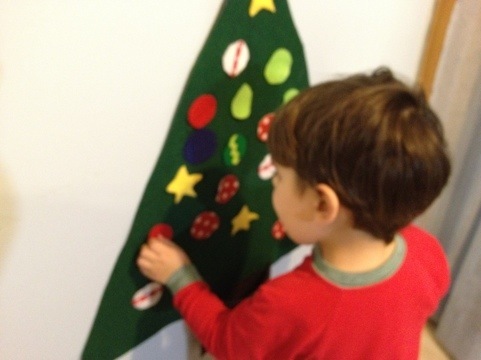 Fold over and glue the sides of the trunk to make a pocket for all your ornaments. Take your ribbon and make a loop, glue the ends to the back of your tree. 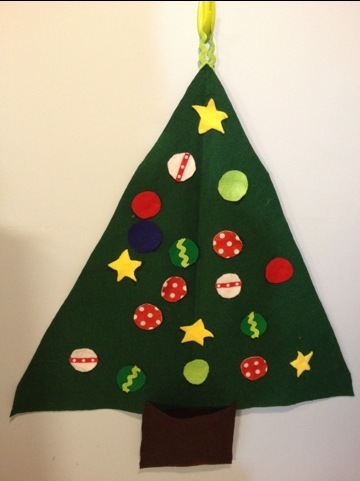 Now get creative and make ornaments out of different colors of felt. 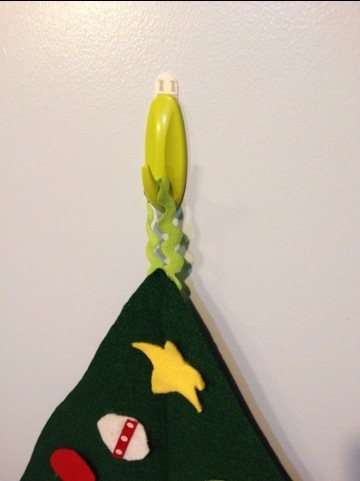 To hang my felt tree I bought a reusable hook. I also use a bit of double sided tape on the back of my tree to help it lay flat against the wall. My kids love their new tree so much I’m thinking about making more of these as Christmas gifts. Great idea with the hook!I always forget about those things. I’ll have to use that next year! Adorable tree! Thank you! I gave several of them as gifts too, with the hook. The other thing that really helped was using double sided tape to keep it flat against the wall. Next year I was thinking I might try to make a gingerbread house like this.